2015 Club Champion Will Brown made the chessgames.com database with this cool game. OK! School is now open. Everybody has to starts somewhere. 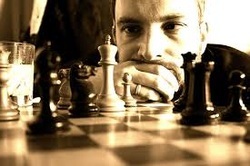 Even the greatest chess master was a novice once. And even the most seasoned player needs to revisit what he already learned. So, we set up a simple set of courses for all levels of players. We are doing this by providing you with both written and video instruction. Here you will find a library with a plethora of all kinds of chess know.edge and wisdom from some of the most knowledgeable oficionados of chess around. Instructional videos and tutorials on the best strategies for the opening, middle and end games; as well as chess traps, steals and tricks. Video analyses of the best and most famous chess games in history, so you can learn the thoughts and strategies of the games masters. Downloadable E-books to ads to your library of knowledge. Some are basic for new players, others are more advanced. Downloadable E-books and videos of related fields of study from around the world. Also enjoy the challenges we provide on the chess puzzle pages.